Sterling Shipyard was established in January 2009 with the intent to provide shipyard services to local operators. Sterling has since been able to work with many local and International companies as well as multiple United States Government agencies. 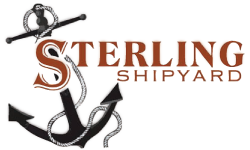 Sterling Shipyard’s success stems from the fact that we are willing to accept any new challenge and are confident that we can successfully build and deliver any type of vessel that our Client’s require, both on time and on budget. As Sterling progresses, we look forward to the continued diversification and growth of our portfolio of vessels which brings new challenges and ultimately grows the company. At Sterling, our employees are our greatest asset and each employee maintains a culture of; work safe, work smart, and prove to the industry, our clients, and ourselves that there’s no better vessel than a Sterling built vessel. No one man or woman is responsible for the success of Sterling Shipyard. It takes a team effort to forge the enviable position Sterling enjoys in the marine construction industry today. Sterling is currently one of the largest employers in Jefferson County, Texas, with a workforce number that is currently approx. 200. Whether it’s New Construction or Repair, Sterling is dedicated to providing our customers the highest quality product in the industry. Sterling Shipyard © 2014. All Rights Reserved.